I’m conscious some clients are being targeted with information promoting several upgrades for the E series turbines. To avoid unnecessary confusion we should explain Earthmill Maintenance’s position on the information you may have received. As we are turbine owners ourselves, we too will have to pay to have these upgrades completed. We therefore understand the importance of making the right decisions to ensure the longevity of our turbines. As such, we have taken the time to evaluate ALL the various solutions being offered in order to give our clients (and ourselves) an independent view on what if anything is best suited to each particular site and situation. Because Earthmill are not manufacturing any of the proposed upgrades we can offer a balanced view. If you would like to talk to us about this, please give the office a call 01937 581011. In some of the older turbines in Endurance the E-3120 fleet there has been instances of cracking in the bedplate of the nacelle due to fatigue. Out of our fleet of over 300 turbines, to date there has only been 1 failure requiring a complete new bedplate. Some high wind-speed and turbulent sites have however developed cracks requiring attention. Earthmill Maintenance and Natural Generation have been working with an engineering company that specialise in welding repairs and have developed a robust process to strengthen the original bedplate to prevent further cracking. The process is relatively inexpensive in comparison to complete new bedplate and does not require the nacelle to be removed. To date we have performed 80 of these repairs and have had zero repeat failures. It is our belief that that this process would be sufficient as a preventative measure for the majority of Earthmill installed sites. However for more exposed and turbulent sites, a new bedplate may be the long term solution. There are currently three companies offering solutions for replacement bed plates. We have visited all three of these companies in order to evaluate which offer the best quality and value for our clients. After in-depth market research considering all the upgrade options available, we felt the solutions provided by Turbine Engineering Developments Ltd (TED) would best meet the needs of our customers and we are therefore proud to announce our partnership with the Yorkshire based company. All TED products are designed and manufactured in the UK to BS EN ISO 9001:2015 standards. The vast majority of components are manufactured by Lyndhurst Precision Engineering Ltd using the same standards used in their products built for aerospace and nuclear industries. Prior to the unfortunate news of the bankruptcy of Endurance Wind Power there was a very important upgrade which Endurance had planned to offer throughout the fleet of E3120 wind turbines. This important upgrade is to change how the blade is connected to the turbine. 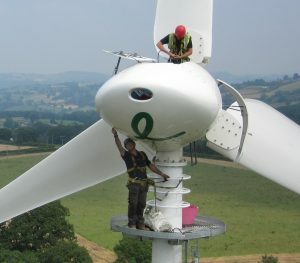 The existing blade guide pin was fitted during the installation of your turbine. It’s a simple bolt which allows the blades to move laterally on the hub and pitch when required in excessively high winds and overspeed conditions. Over time the existing blade guide pins have started to wear the guide holes on the hub, increasing in size and elongation. This excessive wear has a number of detrimental side effects to the operation and maintenance costs of the turbine. is an important factor in the premature failure of existing tie rods. Even a small amount of wear means the blades are no longer held in their optimum position and angle of pitch, which in turn results in a gradual deterioration of the turbines performance and production figures. Case studies at Endurance test sites looked at power curves before and after the upgrade. The results produced improvements in generation across the whole power curve estimated at a 5% increase to annual energy production (depending on the wear level of wear of the original hub). TED have totally redesigned the low speed shaft to reduce fatigue which led to failures in a number of the original machines. The quality of steel used in its construction has also been improved. The patented new design uses a high grade billet with a multi-point fixing. These tried and tested design principles backed up with finite element stress analysis, produce a much more robust system, more commonly used in high stress environments, instead of a taper lock system used in the original Endurance part. TED have also custom made the main bearings and seals, and use a specific grease which seals them for life – the original Endurance sealing arrangement allowed the ingress of water leading premature wear which could ultimately lead to failure. Finally, with the addition of an anti-corrosion finish, this shaft and system has been designed and built for life.